These Fluid Displacement Thermal Actuators designed by [Andrew Benson] are a delightful and profoundly different approach to the Power Harvesting Challenge portion of The Hackaday Prize. While most projects were focused on electrical power, [Andrew]’s design is essentially a mechanical motor that harnesses the fact that Phase Change Materials (PCMs) change volume when they go from liquid to solid or vice-versa; that property is used to provide a useful hydraulic force. In short, it’s a linear actuator that retracts and expands as the PCM freezes or melts. By choosing a material with melting and freezing temperatures that are convenient for the operating environment, an actuator can be reliably operated virtually for free. A proof of concept is the device shown here; a model of a sun-shade that deploys when a certain temperature is reached and retracts when it has cooled. 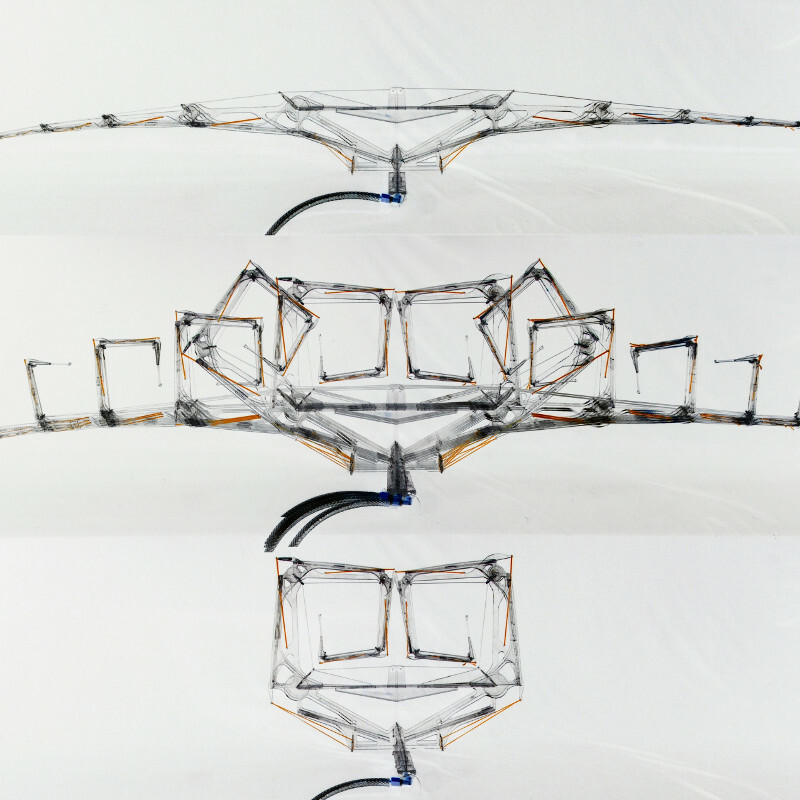 Sunshade concept, from deployed (top) to retracted (bottom). Turning temperature changes into useful physical work is the principle behind things like wax motors and even some self-winding clocks, but what [Andrew] has done is devise a useful method of interfacing directly to the fluids; abstracting away the materials themselves in order to provide mechanical power on the other end. These devices, in general, may not be particularly efficient but they have very few moving parts, are astonishingly reliable, and can operate at virtually any scale. [Andrew] has been thinking big, many of his application ideas are architectural in nature. [Andrew] was inspired to enter his design for The Hackaday Prize, and we’re glad he did because it was selected as one of the finalists in the Power Harvesting Challenge, and will be in the running for the $50,000 Grand Prize. If you also have an idea waiting for an opportunity to shine, now is the time. The Human-Computer Interface Challenge is up next, followed by the Musical Instrument Challenge. All you really need to enter is a documented concept, so sharpen your pencils and give your idea a shot at reaching the next level. Wax-motor greenhouse vent actuators are widely available – coupling these to a hydraulic/pneumatic cylinder to provide transmittable force seems a lot simpler. Elegant designs, though. It sounds like Andrew Benson wasn’t aware of those, though, so he reinvented it from first principles. That’s something to be proud of. Weren’t such actuators covered here on HaD only a few weeks ago? He couldn’t not be aware, any sort of search for thermal actuator information will come up with them as the main example. Seems like he’s done his own version that’s better suited for his purposes, and open to tweaking.